Eastern hardwood with distinctive smooth, gray bark; leaves dark green, pointed-elliptical, toothed. 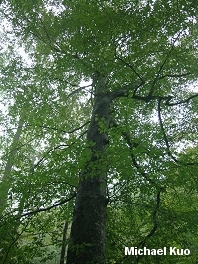 Habitat: Growing with other hardwoods (especially maples) in moist areas; cloning itself copiously and producing numerous saplings near mature trees. Stature: 60-100 feet high; to 3 feet in diameter; with a rounded crown. 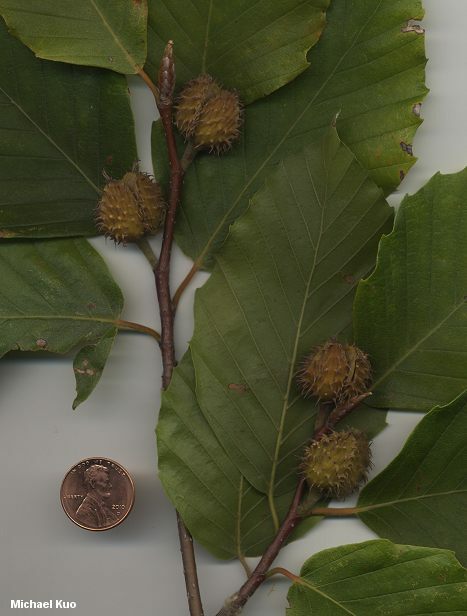 Leaves: Alternate; 2-6 inches long; dark green above, yellowish green below; pointed-elliptical; coarsely toothed; beautifully orange in the fall. 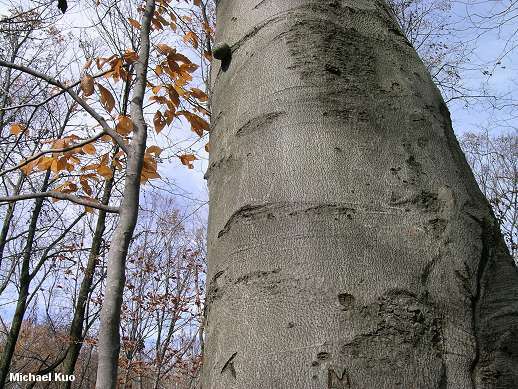 Bark: Thin; bluish gray; smooth; distinctive (I think beech trunks look like elephant or rhinoceros legs). Fruit: A triangular nut under 1 inch long, with a spiny covering. Many mycorrhizal species, including Amanita banningiana, Boletellus pseudochrysenteroides, Boletus atkinsonii, Boletus rubellus, Cantharellus cinnabarinus, Cortinarius azureus, Cortinarius bolaris, Cortinarius corrugatus, Cortinarius marylandensis, Cortinarius ophiopus, Laccaria amethystina, Lactarius gerardii var. fagicola, and Russula pulchra . 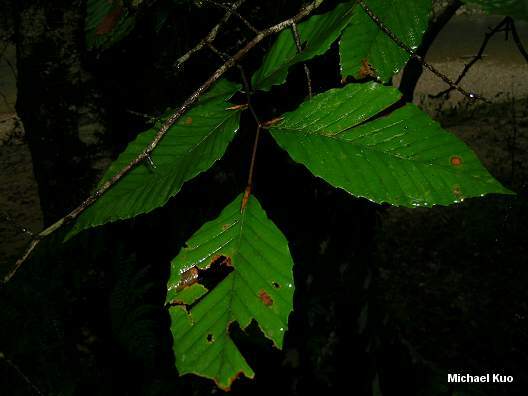 . . and many saprobic species, including Cerrena unicolor, Climacodon septentrionale, Fomes fomentarius, Hymenoscyphus fructigenus, Mycena crocata, Mycena atkinsoniana, Mycena filiformis, Mycena capillaris, Phlebia incarnata, Pleurotus dryinus, and Pluteus lutescens.